Ryan Spence - Wazee 2006. -Photo courtesy of Gayle Peterson. 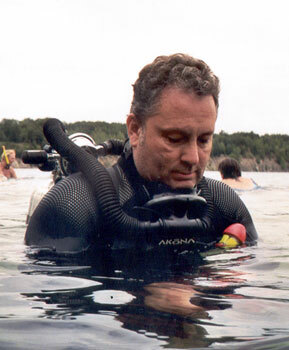 Dan Barringer of Vintage Scuba Supply - Wazee 2006. -Photo courtesy of Bryan Pennington. Gayle Peterson and Mike Follet - Wazee 2006. 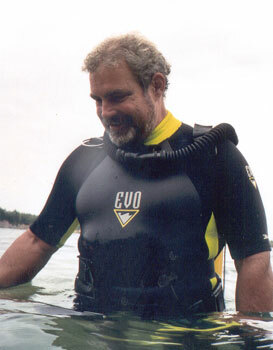 Jerry Lang - Wazee 2006. 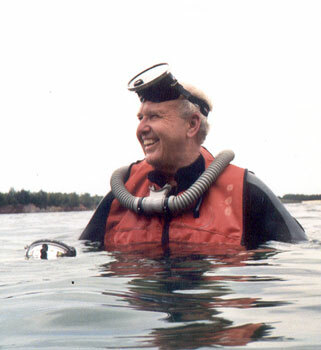 James Williams - Wazee 2006. Mike Follet - Wazee 2006. 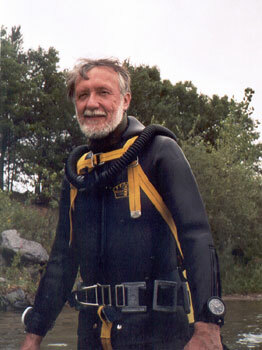 Terry Stevens - Wazee 2006. Bryan Pennington of Vintage Double Hose - Wazee 2006. -Photo courtesy of Gayle Peterson. 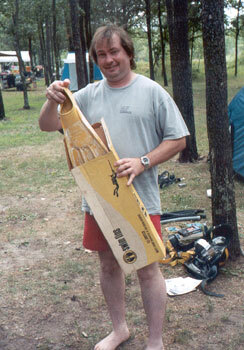 Dave Krafft - Wazee 2006. Jerry Powell - Wazee 2006. Allan Klauda - Wazee 2006. 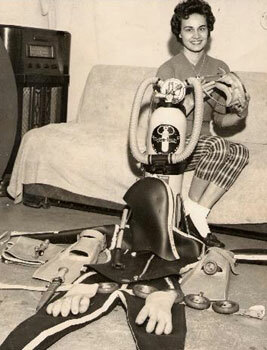 Mildred Turner, posing with her gear back in 1962. 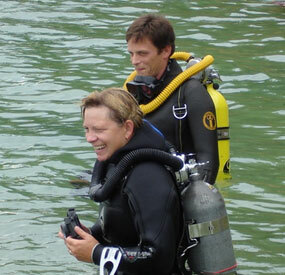 Millie and her husband Gene devote time nowadays to the Lockwood Pioneer Scuba Diving Museum. 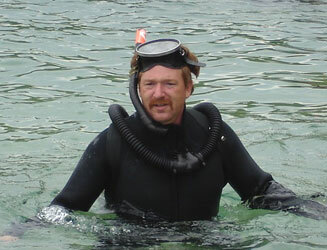 William Pique at Weeki Wachee Springs, Florida, 2006. 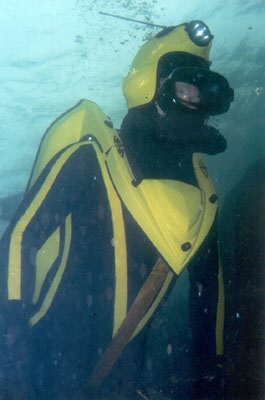 William is diving with his Voit twin tanks, blue Voit 50 Fathom regulator, and Voit Viking fins. -Photo by David Haas. 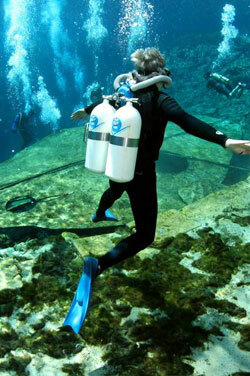 William's lovely wife, Cyndy, at Weeki Wachee. 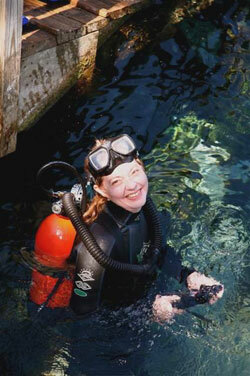 Cyndy is diving with a 38 c.f. Sportways tank and a Royal AquaMaster regulator. -Photo by David Haas. 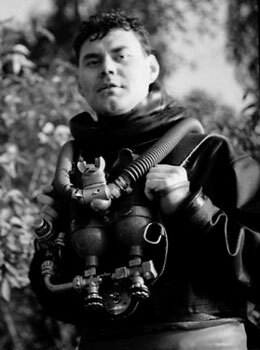 This compelling image, taken by Wolfgang Blank in 1985, shows German author Wolfgang Freihen at Lake Badersee, with his Rolleimarin and one of the first electronic underwater strobes. The bronze lady in front was placed there by King Ludwig II. The Badersee is not far from Neuschwanstein Castle. Ludwig sometimes took his guests in a boat over the maiden. Because the water was very clear, many of them would become frightened upon seeing her. Photo submitted by Franz Rothbrust. 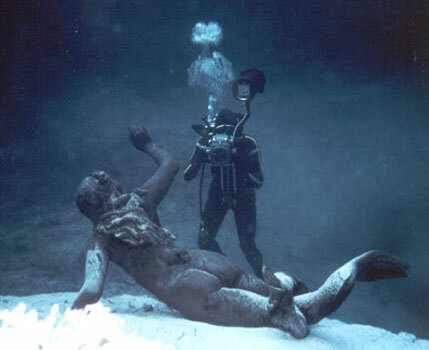 Franz also adds that during "vintage" times, young divers had to dive in the Badersee and give the maiden a kiss. 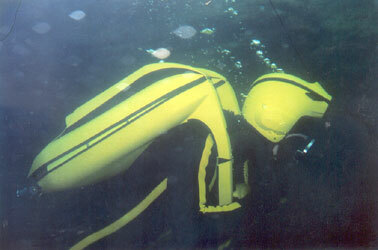 Then they could call themselves a "real diver". He kissed her twice. She lays only a few meters below the surface. Wolfgang Blank in 1959. 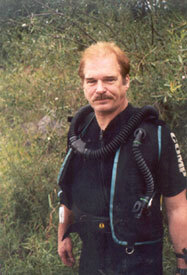 Wolfgang was one of the very first diving instructors in Germany. 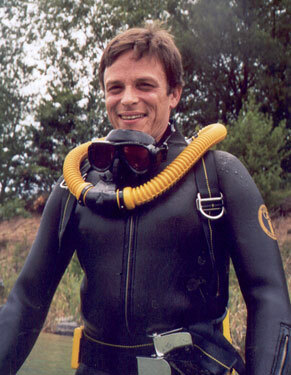 In this picture, he is wearing a dry suit and using a Draeger "Leutnant Lund" rebreather. 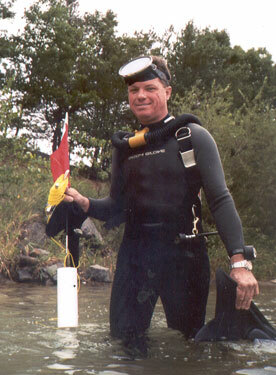 Stephen Taylor wearing a restored Porpoise Universal and Tony Gregory wearing a restored Porpoise CA, Victoria, Australia. 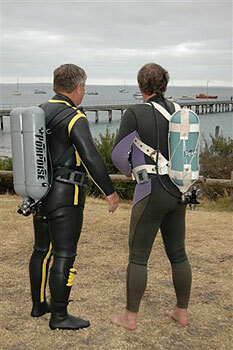 Porpoise scuba was made in Australia and sold as early as 1952. 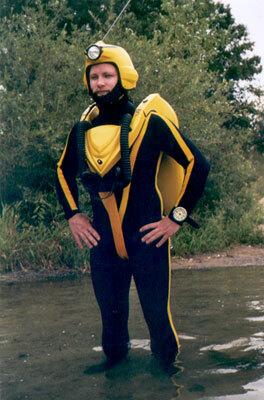 They were the first single hose scuba.